Franz Beckenbauer says a contract he signed with ex-Fifa vice-president Jack Warner before the vote on hosting the 2006 World Cup was an aid package. Germany beat South Africa in a vote in 2000 to stage the 2006 tournament. Beckenbauer, then head of Germany's World Cup organising committee, said: "Looking at it from today's point of view, many things look funny, but we simply meant well at the time." 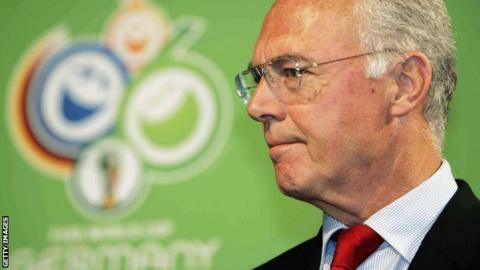 In October, Beckenbauer said he made a "mistake" in the 2006 bidding process. Reports have alleged that the organising committee made a payment to Fifa in return for a financial grant. Der Spiegel magazine claimed in October that an alleged slush fund of 6.7 million euros (£4.8m) was used to buy votes for Germany - an allegation denied by the German Football Association (DFB). Beckenbauer, who won the World Cup as captain of West Germany in 1974 and as coach in 1990, told the Sueddeutsche newspaper that the deal with Warner was signed before the vote in 2000 and was meant as "a development aid package with ticketing possibilities". Beckenbauer added: "I simply always signed everything. I even signed carte blanche." He denied buying votes, saying "we didn't have any money". Warner, the former head of Caribbean and North and Central American football (Concacaf), was banned from football for life in September and quit Fifa in 2011. He is fighting extradition to the US on corruption charges and denies accepting millions of dollars in bribes. That is Ronaldo - or is it Messi?